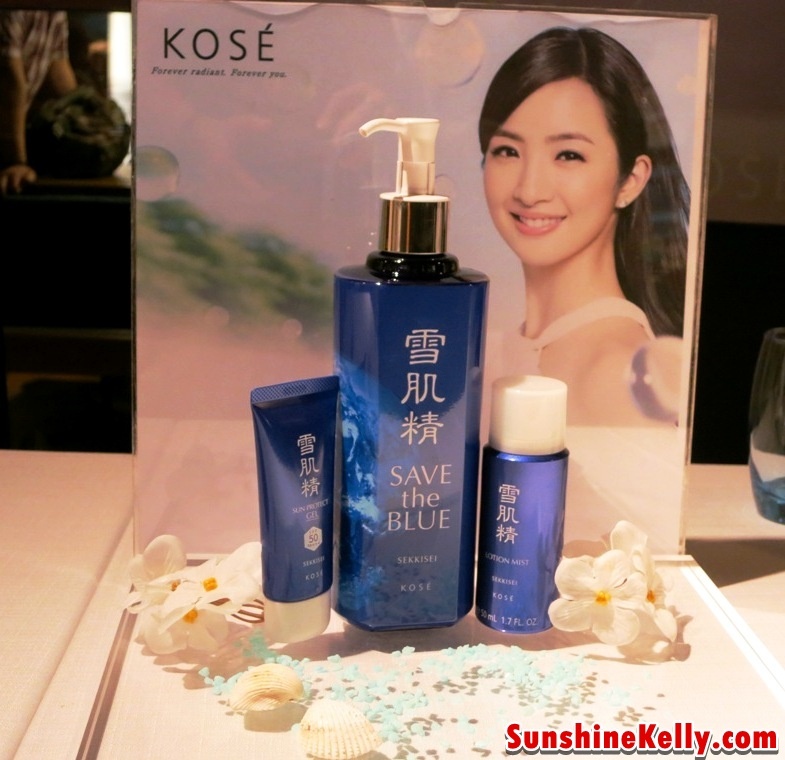 Last Friday, my fist time to meet Ariel Lin, the latest KOSE Spokesperson & Celebrity at KOSE Face the Sun Save the Blue project at Mid Valley Megamall. Ariel Lin is a Taiwanese actress and singer who won Best Leading Actress in a Television Series at the 43rd and 47th Golden Bell Awards. Save The Blue Project is an environmental initiative by KOSE to protect the world’s fast depleting coral reefs. This project take place in Singapore, Thailand, China, Hong Kong, Taiwan and Malaysia. Whereby certain percentage of the sales amount will be donated to save the environment project. 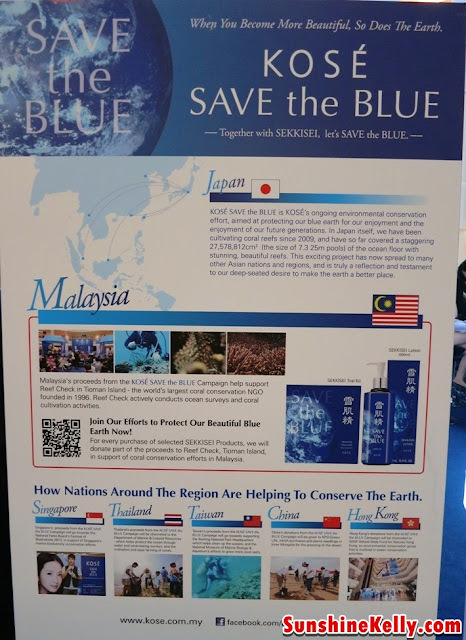 Beginning with the corals reefs off the Japanese island of Okinawa since 2009, the Save the Blue project now expands to Malaysia from 2011 onwards. 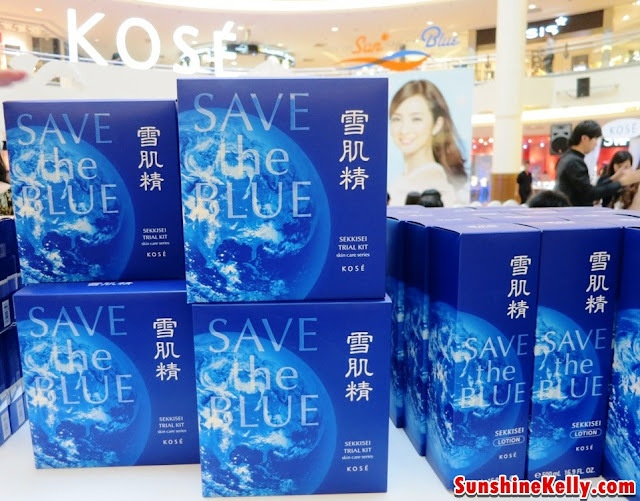 The KOSE SAVE the BLUE project is continuing on until now. Reef Check the world’s largest coral conservation NGO was founded in 1996. Reef Check Malaysia was established in 2007. Since then, they have been actively conducting ocean surveys and coral cultivation activities. KOSE is supporting their activities through donation. For year 2012, 2% of sales amount of SEKKISEI Lotion 360ml Save the Blue Limited Edition and SEKKISEI Travel Set Save the Blue Limited Edition, Infinity Lotion Concentrate 14- I 160ml Save the Blue Limited Edition and Infinity Lotion Concentrate 14- II 160ml Save the Blue Limited Edition donated to Reef Check organization (is a non-profit organization registered in Malaysia working to conserve coral reefs). For year 2013, KOSE will continue support coral activation activities through donation. For every purchase of SEKKISEI Lotion Save the Blue Limited Edition 500ml and SEKKISEI Travel Set. KOSÉ will donate part of the proceeds to the research, education and conservation efforts of Malaysia’s coral reefs. She is really really pretty. Even prettier as she gets older.